Like most whiskey aficionados, we also love a great beer. And in particular, we became very fond of barrel-aged beers, which from time to time had been aged in our whiskey barrels! So we decided to have some fun and make our own beer. We partnered with a great craft brewery (the Beltway Brewing Co. in Sterling, VA) and began working with their master brewer to create a beer that would age best in barrels that previously held our award-winning James E. Pepper "1776" Rye Whiskey. No more than 30 days after our whiskey barrels are dumped in Kentucky, they are at the brewery being filled with beer. This ensures that every batch gets a rich Rye whiskey finish and notes of toffee, chocolate, oak, and vanilla. Because we buy barrels from the cooper to age our whiskey, and then we monitor that maturation process over the years until we bottle our whiskey, we have complete control over the age and type of barrels we use. We think that is a big reason why this beer has come out with such uniquely rich flavor and taste. Cheers! 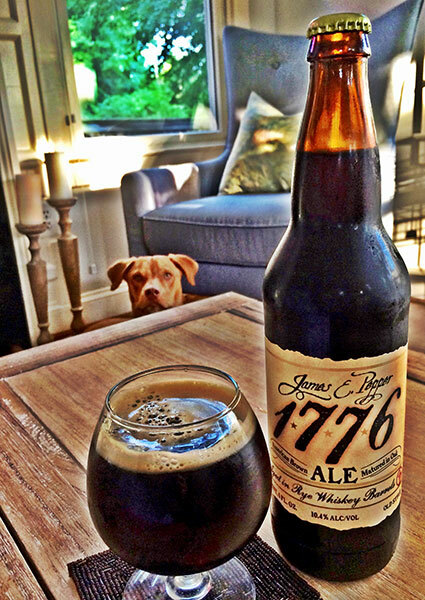 1776 Smoked American Brown Ale aged in Rye Whiskey Barrels 10.4% Alc. 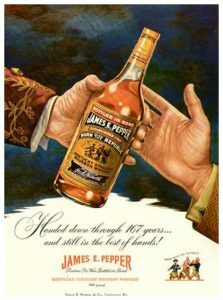 The Pepper family brand of whiskey is an iconic Kentucky whiskey brand initially produced during the American Revolution and continued through 1958. The family built and operated two main distilleries: first founding the site that today hosts the Woodford Reserve Distillery, and later the James E. Pepper Distillery in Lexington. In the late 1950s the bourbon industry hit hard times, and both the brand and distillery in Lexington were abandoned for over half a century. In 2008 the brand was relaunched by whiskey entrepreneur Amir Peay. A decade-long campaign of thorough historical research and collection of historic materials was used to retell the lost story of this iconic American whiskey brand and to distill new stocks of "Pepper" whiskey (visit the History Page to learn more). To initiate the relaunch of the brand, partnerships with existing distilleries were formed. Today the whiskey sold under the 1776 line of whiskeys was distilled years ago in collaboration with the historic Lawrenceburg Distillery in Indiana. After a multi-year construction effort, the historic James E. Pepper Distillery—which after fifty years of neglect had fallen into a terrible state of disrepair—has been completely rebuilt and restored. In December 2017, the distillery once again began distilling whiskey. Learn more about the distillery project on our Distillery Page.